Lomani Island Resort is an intimate boutique resort located in the Mamanuca Islands in Fiji. The resort offers 26 lovely Bures and Suites, and is situated on 7 kilometers of white sandy beach with crystal clear waters. Lomani caters to the adult crowd, with the minimum accepted age of 17. All rooms have a view of the sea – a lovely spot for those seeking the perfect Fiji Honeymoon. 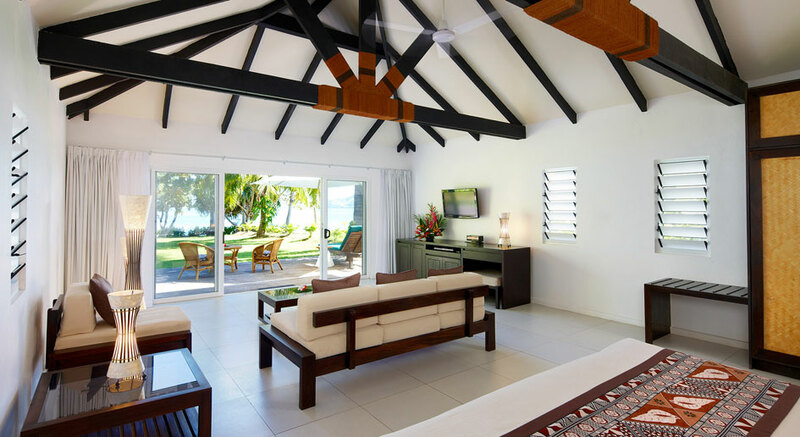 With only 26 Bures and Suites, designed for couples, Lomani Island Resort is very private and exclusive. Bures and Suites are situated along the shoreline, just meters from the beach. Traditionally designed, the rooms are light, airy, and all accomodations include air conditioning, mini fridge, daily maid service with evening turn down service, room service delivery, complimentary laundry service among many other amenities. Breakfast is included in the tariff, and the resort offers fine dining at the Flame Tree, which boasts delicious Pacific Rim cuisine with a Fijian twist featuring fresh seafood and locally sourced ingredients. Also available is the Lomani Cocktail Bar which offers a tantalizing array of drinks from creamy coladas to muddled mojitos as well as fine wines from New Zealand, Australia and French Champagnes. There is also a local market, as well as two other resorts on the island in which to dine. Ask us about their all inclusive meal plan which is also available at a reasonable price. Lomani provides you with the most stress free Wedding Day filled with romance and casual island elegance. Your location options include a beachfront setting, a private island offshore setting, or the lovely Picnic Point Bure. All rates are unbelievably reasonable and affordable. At certain times of the year, Lomani Island Resort offers free Fijian Weddings or Renewal of Vows packages. Ask us for details. We will help with all documentation and the process is quite easy. Lomani is the perfect choice for the adults in your wedding party, and if your guests are traveling with family they can stay at Lomani’s sister property next door – Plantation Island Resort. Lomani Island Resort accepts adult guests & children above 16 years of age. Children under 16 may be included if the resort is booked on a charter basis.